Planner Refills? In 2010? – Write with us! Just when you thought everything was going digital, the paper planner refill is on the rise. How do I know? Well a gentleman came into the shop today with a leather planner that had a calendar refill from 2007. He said he tried to go paperless and use is electronic calendar for meetings and notes. But over the years he found it more difficult to manage. “There’s something about writing it down that makes me remember what I need to do”, he said. So he’s on the hunt for a calendar replacement for his outdated leather planner. I think the manufacturer is out of business, so good luck with that. But he’s not the only one. 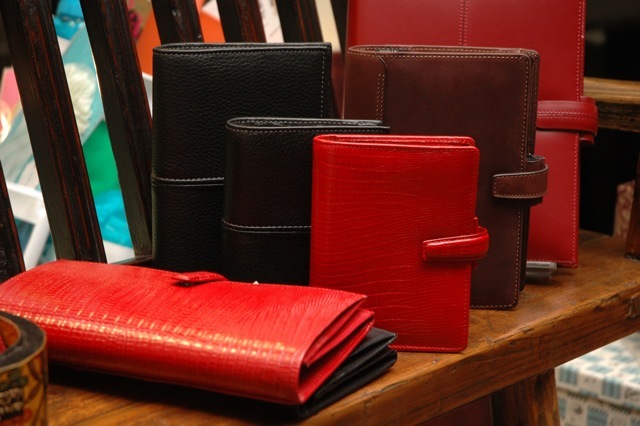 Today several people came in to purchase a 2010 refill for their Filofax leather planners. Turns out that not many retailers are carrying refills and planners anymore assuming everyone’s going digital. Well if you’re like those of us that are “techie” except when it comes to keeping a calendar and taking notes, we have Filofax Planners in 3 sizes and many colors and materials. They are priced from $25 up to $2300 for alligator. So in case you still like to pull out a pen and leather notebook to schedule a meeting or lunch, we have what you need.